After an introduction by Viola Davis, the 67-year-old movie icon called out the president-elect (without actually mentioning his name) for mocking New York Times investigative reporter Serge F. Kovaleski, who suffers from a congenital joint condition, during a campaign rally last year. Streep also honored the late Star Wars actress Carrie Fisher, who died at the age of 60 on December 27. Read the full transcript of Streep&apos;s powerful speech below. "Thank you. I love you all. You&apos;ll have to forgive me. I&apos;ve lost my voice in screaming and lamentation this weekend. And I have lost my mind sometime earlier this year, so I have to read. "Thank you, Hollywood Foreign Press. Just to pick up on what Hugh Laurie said, you and all of us in this room, really, belong to the most vilified segments in American society right now. Think about it. Hollywood, foreigners and the press. But who are we? And, you know, what is Hollywood anyway? It&apos;s just a bunch of people from other places. "I was born and raised and created in the public schools of New Jersey. Viola was born in a sharecropper&apos;s cabin in South Carolina, grew up in Central Falls, Rhode Island. Sarah Paulson was raised by a single mom in Brooklyn. Sarah Jessica Parker was one of seven or eight kids from Ohio. Amy Adams was born in Italy. Natalie Portman was born in Jerusalem. Where are their birth certificates? And the beautiful Ruth Negga was born in Ethiopia, raised in — no, in Ireland, I do believe — and she&apos;s here nominated for playing a small-town girl from Virginia. Ryan Gosling, like all the nicest people, is Canadian. And Dev Patel was born in Kenya, raised in London, is here for playing an Indian raised in Tasmania. "Hollywood is crawling with outsiders and foreigners. If you kick &apos;em all out, you&apos;ll have nothing to watch but football and mixed martial arts, which are not the arts. They gave me three seconds to say this. "An actor&apos;s only job is to enter the lives of people who are different from us and let you feel what that feels like. And there were many, many, many powerful performances this year that did exactly that — breathtaking, passionate work. "There was one performance this year that stunned me. It sank its hooks in my heart. Not because it was good. There was nothing good about it. But it was effective and it did its job. It made its intended audience laugh and show their teeth. It was that moment when the person asking to sit in the most respected seat in our country imitated a disabled reporter, someone he outranked in privilege, power and the capacity to fight back. It kind of broke my heart when I saw it. I still can&apos;t get it out of my head because it wasn&apos;t in a movie. It was real life. "And this instinct to humiliate, when it&apos;s modeled by someone in the public platform, by someone powerful, it filters down into everybody&apos;s life because it kind of gives permission for other people to do the same thing. Disrespect invites disrespect. Violence incites violence. And when the powerful use their position to bully others, we all lose. OK. Go on with that thing. This brings me to the press. We need the principled press to hold power to account, to call them on the carpet for every outrage. That&apos;s why our founders enshrined the press and its freedoms in our Constitution. "So I only ask the famously well-heeled Hollywood Foreign Press and all of us in our community to join me in supporting the committee to protect journalists because we&apos;re going to need them going forward. And they&apos;ll need us to safeguard the truth. "One more thing. 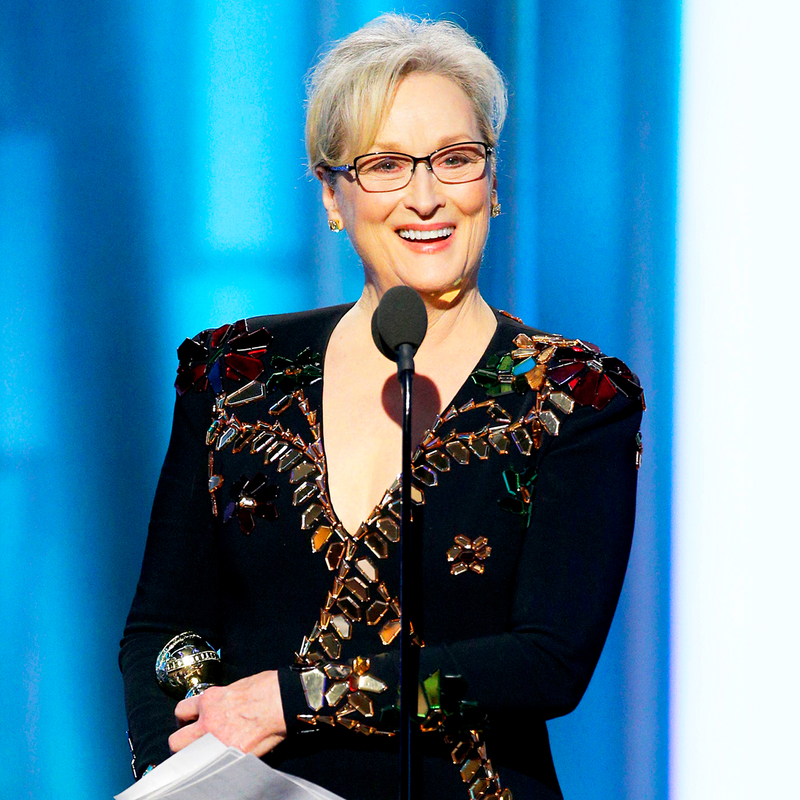 Once, when I was standing around on the set one day whining about something — we were going to work through supper, or the long hours or whatever — Tommy Lee Jones said to me, &apos;Isn&apos;t it such a privilege, Meryl, just to be an actor?&apos; Yeah, it is. And we have to remind each other of the privilege and the responsibility of the act of empathy. "We should all be very proud of the work Hollywood honors here tonight. As my friend, the dear departed Princess Leia said to me once, &apos;Take your broken heart, make it into art.&apos; Thank you."